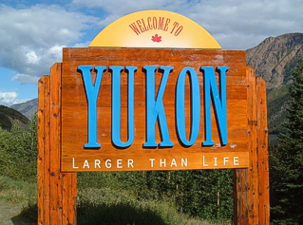 The Yukon is a Canadian region located north of Canada's westernmost province of British Columbia. It shares Alaska's eastern border and is named after the Yukon River. At 5,959 meters ( 19,551 ft ), Yukon's Mount Logan, in Kluane National Park and Reserve, is the highest mountain in Canada and the second highest of North America. The climate is Arctic and subarctic and very dry, with long, cold winters, the long sunshine hours in short summer allow hardy crops and vegetables, along with a profusion of flowers and fruit. The Yukon's historical major industry has been the mining of lead, zinc, silver, gold, asbestos and copper. The government acquired the land from the Hudson's Bay Company in 1870 and split it from the Northwest Territories in 1898 to fill the need for local government created by the population influx of the gold rush. Today, the government sector is by far the biggest employer. On December 11th, 1996 between 7pm and 10pm, over 30 people in separate locations reported seeing a football field sized UFO near Fox Lake in Canada's Yukon Territory. Witnesses describe rows of multicolored lights and said that the craft blocked out the stars and shot beams of light down to the ground. One witness said the tape deck in her car slowed down and the lights on her dashboard flickered as the object passed overhead. Another witness watched it approach him from over Fox Lake and pass overhead, during which time he could see what appeared to be windows. The sighting was investigated by Martin Jasek of the Yukon UFO Research Society and published by UFOBC as Special Report No 1.